What subject has become an indispensable companion of people's life in the last 10 years? Without what thing people can not imagine their existence at work and at home? Of course, this is a personal computer. It is used to performing calculations, printing documents, watching movies, games... The list can be endless. There are also the smart phones, which help to "kill time", when the computer is not around. Gadgets perform hundreds or even thousands of different actions. However, sometimes a terrible thing happens - a true friend breaks. And then what? Of course, people immediately begin to look for the master and they do it on the Internet. Therefore, if you want to do the gadgets’ repair - you need your own website. And our template will help you in creating it! With it, you will be able to convey to customers not only price list, but a lot of other useful information (where they can find you, what problems you can help them solve, etc.). Our experts will help you at any stage of creating the site and answer all questions. The site is created on the user-friendly platform and has an original design solution. We always welcome new customers! 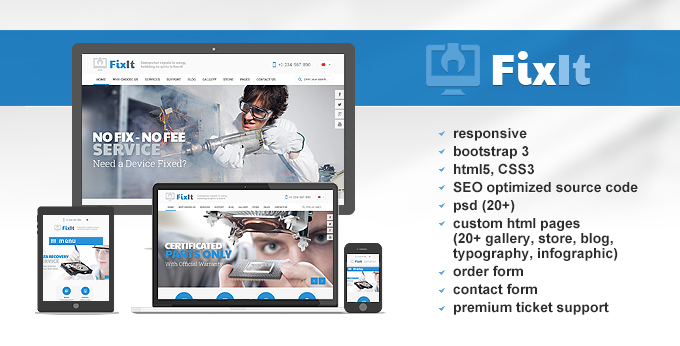 Make your online business successful and your website popular with Fixit Computer Repair Website Template!